Follow along as 17 student teachers spend 5 weeks in Belize teaching in the local schools of San Pedro! When people ask me "How was Belize?" I find it so difficult to truely convey the answer. Words that come to mind are Amazing, Beautiful, Wonderful, Indescribeble, and of course Un-Belize-Able!! But I know I will never be able to fully express what going to Belize really meant to me. Having had a fairly unconventional College experience, having the opportunity to share the experience with 17 others, all of close quarters, was an experience all on its own. I am thankful for the friendships I made with the only people who will ever really understand what the experience was really like. During my time in Belize, I formed friendships with the locals that will stay with me forever. As I made my way to the airport, I remember thinking you aren't suppose to be this sad to leave for home. Saying goodbye to my new friends Loreni and Luis as well as Chico from my favorite restaurant, and sweet Alex one of the young boys who sold jeweley was more diffiuclt then I could have imagined. As excited as I was to get home, leaving the place that had been my home for the last 5 weeks was bittersweet. I hope that this experience will act as the stepping stone I hope it was in preparing me to enter into the Peace Corps. I know this was only a small taste to what living in a 3rd world country is like, but it was a great glimpse into life in other countries. As I embark on the rest of my teaching future I will always remember this great adventure and experience. And remember "Don't Stop Belizing!!" 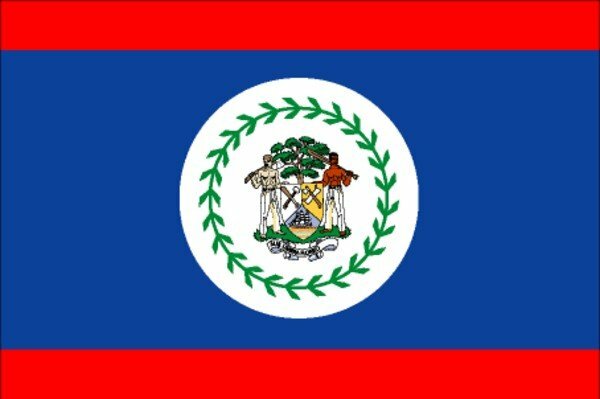 Every Monday, Wednesday and Friday morning, Isla Bonita Primary School would have assembly and as a part of their morning assembly they would sing the Belize National Anthem. Listening to them sing would remind me of our own anthem and I was interested in hearing the differences. On our last day at Isla Bonita, we student interns decided to sing the Star Spangle Banner for our assembly and it was wonderful getting to share our anthem with our kids in the same way they shared their with us. Here is the words to the Belize National Anthem as well as a video with the song. 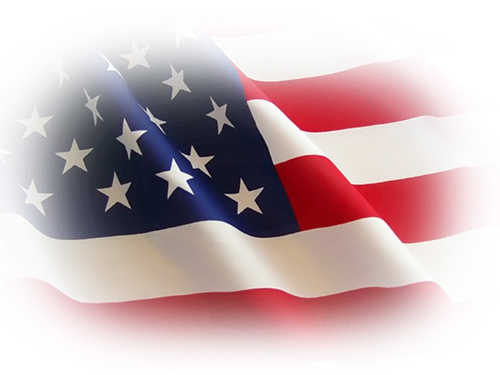 And of course the National Anthem of the United States of America! While everyone else is comparing their teaching experience in Belize to that of Wilmington, I suppose I should compare my experience here in Jacksonville. One thing I have always been fortunate of was having the opportunity of growing up in Jacksonville. Sure 'Action-Ville as falsely dubbed by many can be very un-actiony and many times I feel it is lacking in many areas, one thing I have always been proud of was our military. What many people don't understand about this city is that few people who live in Jacksonville are actually from here. I remember in my classes when we had to stand up and introduce ourselves (which by the way I hated) and had to say something interesting about yourself, their was always 1 person who said they were actually from here, while the other 30 or so of us had a military connection. The military brings people of all races, religions and traditions into one town. I have met people from all over the US and was fortunate enough to grow up in a fairly diverse community. We are truely a melting pot of different people and that has helped in preparing me to enter into the diverse classrooms that no book or class can effectively teach you. I have met many people from small towns where they grew up with the same people their whole life. When they leave their home town, if they ever do, I feel they aren't as prepared to face a diverse society and interact with the different people of the world. In the many classrooms I have taught in here in Jacksonville, my classes are generally very diverse in its students. Just as Jacksonville is diverse in its people, Belize is known for its diversity also. Not only are their people of different races and cultures, you have people from all over the WORLD living in Belize. It was interesting to see how accepting people are of others when they have been exposed to diversity their whole life. An area I couldn't get over was that involving technology. Here in the US, teaching and education have been become over run with using technology in the classroom. In our elementary schools, gone are the foreign language classes and other electives and in its place we now have computers. In the method classes we took in preparation for teaching, not only do we take a class on how to use technlogy in the class, but in every other class we take use of technology is required. When creating lessons, we had to integrate technology as much as possible, and if you didn't you were asked why. For me, I often found it difficult to use technology all the time preferring to teach a little more old fashioned. Yet even though I believe my students showed positive results at the end of each lesson, I was often told by professors I needed to incorporate more technology. Even now in the new teaching standards there is an area you are graded based on how much technology you use in the classroom. For me though, I was already considering how teaching in the Peace Corps or other 3rd world countries would be like without the aid of technology. We are prepared to teach and create lesson plans, but only with the use of technology. We use technology to find lesson ideas, printables, and more. When we teach, it is so easy to just hook up your computer and project what you need. As we begin having to teach fairly difficult concepts technology allows for lessons to be taught easier through the easily accessible information and the easy at which the information can be presented to the students. In Belize, technology was hard to come by. On any given day you were lucky to have electricity, let alone access to the internet. When lesson planning, I had to get really creative in not only planning what I was going to teach, but in finding a way to teach it. I had to really use my brain in order to create a lesson based on just my knowledge and the supplies I had available which often wasn't much. I developed a true admiration for the teachers of Belize and other parts of the world that are able to teach these creative and successful lessons without the aid of technology I believe we in the US take for granted. America and Belize handle behavior management two totally different ways. In my classroom here, my kids all raised their hands, stayed in their seats and knew when to not interrupt an adult. Failure to abide by such social normals resulted in swift consequences. Yet in Belize the students would come right up to you and with a 'Mis, Mis' poke at you until you answered them. I often found this difficult to deal with especially if at the time I was working with another student. During my time in the classroom I did work with the students in raising their hands, not calling out or coming up to me, but I understood it was a part of the culture and wasn't to try to take over with my American mind set. I did find it interesting, that while not exactly smiled upon, one way teachers in Belize get a child to behave may be with a a physical consequence. While I never say or used it first hand, I heard many stories of teachers who would either threaten to get 'Hector' the male teacher or just reach over and smack a kid on the arm or so. In the States you have to have special permission to even grab a kid to stop him or her from hurting themselves or someone else. I can't imagine a parents reaction if I smacked a kids hand for something. That is one major differences between Belize and America. In America I find we treat our child as fragile beings. We tell them not to do this or that in case they may be hurt. On the play ground kids are instructed to keep their hands to themselves not even encouraged to play games like tag. I often had to tell a student hands to themselves even if they were only playing in fear they would hurt themselves or someone else. On the playground, younger children were limited in what equipment and activities they could do such as not being able to play on the monkey bars which were deemed to high and other activities that were deemed to dangerous. Yet in Belize, my kids would practically tackle one another and no one would say a word. They would leap onto walls and climb what one may consider dangerous equipment. I once say kids using a fallen basketball hoop as a jungle gym. I had to stop myself from telling a child to stop what they were doing in case they got hurt. I think that in the years fear of consequences of a child being hurt in the US has caused adults to baby our children. We are afraid of law suits and threats to our jobs and lively hood that we restrict our kids from being kids. If a kid falls and breaks his arm, police reports are being filed and people are being questioned. I understand the need to protect of kids, but are we protecting them to much? One last comparison is the instruction in the classroom. In the schools in the States we are pushing for child focused instruction. Let the students be creative, ask the questions and lead the instruction with a teacher a a facilitator. We focus on small group, creativity, hand on and critical thinking. Our classes are also dominated in teaching Language Arts. We devote more of our days to language arts related instruction with reading and writing being at the fore front. In Belize, instruction is often led my the teacher through lector and notes. Workbooks a a HUGE part of instruction and I was amazed how much the kids actual wanted to work in them. When I tried to teach a lesson that focused more on creativity and thinking past exact answers the students would get fustrated and ask to just take their notes. Even when given the opportunity for creativity, they would say it was too hard and ask for the teacher to do it for them instead of expressing themselves. In the States my kids favorite time was when they got to be creative. Belizean students seem to focus more on 'the facts' preferring math and science where answers are either right or wrong. They didn't enjoy the idea of having to think about a subject for more then that right or wrong answer. I feel that a reason Language Arts isn't highly regarded is that even though English is used in the schools, it isn't most of the students of teachers native tongue. Many of the teachers dislikie reading and writing and are unsure how to teach it effectively. They are unsure how to make it fun for the kids so stick to basics that becomes boring for all involve. What I did like though was that the teachers know that language arts is their weak point yet they are interested in ideas on how to improve their instruction. I found so many similarities and differences in my schools here in Jacksonville and in Belize. But in the end I realized that no matter what, kids are kids regardless of where you are. After spending time in both San Ignacio and San Pedro as well as San Joaquin, I was able to really get a feel for the differences and similarities of Belize. I often was asked about what the US was like. That was a difficult question for me to answer. I have had the opportunity of visiting many parts of the US. My family is from Brooklyn, NY so I spent much of my childhood. That mixed with family in Florida and I have been to every State on the East Coast. I was born in Vista California, and recently was able to visit San Francisco so from that I have some West Coast experience. I enjoy the mountains and have traveled a few times to the western side of NC exploring many of the sites there. I have loved growing up in Jacksonville, NC because of it being a military town. I have met people from all over the country and having made friends with many of these people I have been able to learn from them as well as visit place such as Texas, Kentucky, Ohio and more. What I have learned at the States is that while we are one Nation, we are a Nation of different people, cultures, and experiences. The East Coast is different from the West Coast, and who is more different then those of the North and the South. In the same way the US is a country filled with different people and ways of life, Belize is the same. While I spent the majority of my time on the Island of San Pedro, I was able to notice the differences on the mainland. The Island is definitely more laid back and gears to the tourists. Everyone on the Island speaks fluent English and much of what you find on the Island caters to the American way of life. There were many times where I forgot we were even in a 3rd world country. Jobs on the island are generally tourist related with locals selling merchandise, working at food stands and restaurants and acting as guides. The land is what you would expect on an island, with sandy beaches, crystal waters, and the only real plant life showing in coconut and palm trees. The land is very flat which made having to walk everywhere much easier. Transportation was in the form of walking, golf carts, bicycles and the very limitied cars. Because we were on an island and the many goods had to be imported, life on the island could be very expensive for both the tourists and the locals. What I noticed about the mainland was that you received much more of a Central American feel. Many of the people didn't speak fluent English and it was more difficult to communicate with them. When visiting the Village of San Joaquin in Northern Belize I was able to stay with my teachers family. While she and her husband as well as their brothers spoke English, her parents spoke very limited English. We had to develop a kind of Spanglish thing to communicate. Even those who can speak English tended to slip into their native tongue and carry on a conversation that I couldn't follow. Landwise, San Ignacio was VERY hilly. Filled with caves, mountains and more this was the place to go if you were looking for the adventureous side of Belize. I loved getting to travel through parts of the jungle seeing a different kind of beauty that we saw on the island. San Pedro which was mainly flat, trying to make it just up the street in San Ignacio could be difficult. Up in San Joaquin, was almost a mixture of San Pedro and San Ignacio with it being flat yet very green. Both places inland had more opportunites of growing food and you could drive by miles of growing crops. Many families made their lives by what they grew in their own backyards. The mainland had many roads so instead of golf carts their we more cars and chicken buses that were used to travel. Weather wise, while all of Belize is hot, I preferred the weather inland. It was much less humid inland and the vast trees helped keep it a little cooler. If I had to choose where to teach San Pedro or inland, I think I would have chosen inland. Staying on the Island sometimes felt more like I was on Vacation. I think that if I had lived inland for 5 weeks, I would have came away with not only a stronger understanding of Spanish, but a feeling as if I had lived in a 3rd world country. I think that the inland experience would have given me a larger feel and understanding of the country of Belize. I also think I would have enjoyed exploring the mainland more for its adventures. I have grown up in NC and by the beach. Yet even though I am by the beach, I prefer to travel and spend time in the mountains hiking and exploring. I would have enjoyed having more of those opportunites if I had stayed inland. Either way, I LOVED every opportunity I had in Belize and i feel very fortunate that I was able to travel to so many areas and was able to actual compare the areas. Not many people can say they traveled to 3 completely different areas of Belize. I wouldn't give up any of my experiences. The saying of you don't know what you are missing until you don't have it comes to mind when thinking about privledges. I was fairly prepared to go without big things, but it really is the little things that you take for granted. Modern conviences that we have in the States we take advantages of and when we don't have them we are unsure how to handle it. I think the first realization that we were in a 3rd world country was during our first weekend, when the power went out! Now I have been in situations where the power went out, but those were generally extreme cases such as weather or accident involved. For the people of Belize they acted like it was no big things and went about their day. In the States, a power outage would cause maintence workers to get moving immediately, yet here in Belize there seemed to be no rush to resolve the issues. In later weeks when I would wake up in the middle of the night sweating because the power went off in the middle of the night, or having to teach with no AC I was reminded of how privledged we are in the States to have electricity at the ready. When I am lesson planning, it is so easy to google a subject for ideas or information. When I had to lesson plan with use of the internet, I found I had to really use my brain and get creative. I can remember how fustrated many of us would get over the limited internet use. But at least I had the internet. So many locals barely have enough money for electricity let alone internet. I am so use to going anywhere in the States, including McDonalds and having Wifi, I had a hard time dealing with the limited amount of places one could go for internet access. 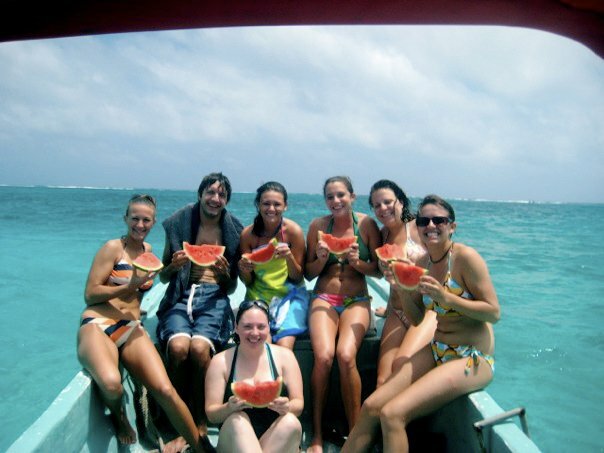 Living on the Island, as well as Belize in general, is very expensive. Due to having to import many of what find conviences, many items are at least double the price they would be here in the States. This makes buying things, such as a laptop, difficult. I have already had 3 laptops in ten years. Yet people such as my partnership teacher in Belize could really use a laptop yet can't afford to get one. A laptop would aid her so much in her teaching, yet the chances of her being able to get a laptop in Belize is very slim. When I decided I needed a new laptop, I took my latest pay check, went to the Best Buy and came home with my new purchase a few hours later. Having constant access to water is another privledge we have here. During our week of no water, I took to appreciating having enough water to brush my teeth let alone take a shower. During my stay inland, there was no hot water. I had to fill a bucket with water, then add boiling water to it in order to have a warm bath. I then had to use a bowl to pour the water on me for my 'shower'. You really can't appreciate how lucky you are to have water at the ready until you turn on a facet... and nothing comes out. In addition to having access to the modern conviences we all know and love, I believe one of the most important privledges we have that we often take advantage of is our availabilty to a good education. As an extension student, I understand fully how far education has come. The majority of my classes were done through online instruction and the rest of my classes were provided through the satelite program of UNCW teachers teaching here in Jacksonville. I never would have been able to finish my education without this program. I was able to complete my education, without having to leave Jacksonville. This allowed me to continue to work and save money while taking classes instead of having to travel and live at an University to complete my education. Right now many people on the island are interested in furthering their education, but do not have the means. To continue taking classes to be a teacher, you would have to travel to the mainland. Right now it is to expensive to pay instructors to come to the island, and most locals do not have the internet capability to take online classes. Just as people have since the beginning of civilization, regardless of what you have, you adapt to your surrounding to survive. 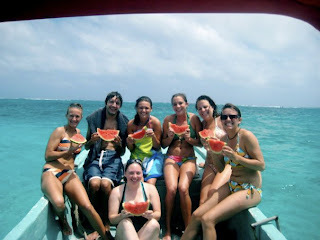 The people of Belize are use to their life style, and you really don't miss what you don't have. It is also amazing how quickly I was able to adapt to the living conditions in Belize. After the first blackout, I barely even flinch when th power went out. I prepared for the lack of water when possible, and I found alternatives when I could. But in the same way i quickly adapted to the Belizean environment, I was amazed how quickly I fell back into life in the States. I think it is easy to forget how lucky and privledged we are compared to much of the world. When we embarked on our Belizean Adventure, I never would have thought I would have formed the wonderful relationship with my teacher as I did. After out first meeting, she invited me to her house, which was right around the corner from where we were staying. Stephanie and I shared a 1 evening of many with both Loreni and her husband Luis. Having our new friends show us around town allowed us to see more of the culture in 1 night then we may have even experienced. While we spent much time together on the island, I was overwhelmed and honored by an invitation to go home with them to their village on mainland Belize in San Joaquin located in the Corozul District. This was the experience I had been wanting since I began showing interest in the Peace Corps. 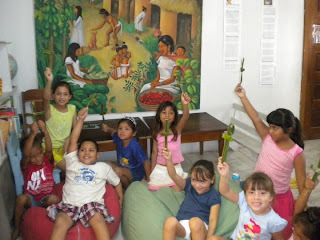 The opportunity to truely see how the people of Belize lived. I took the puddle jumper into Corozul. The sight was quite different then the flight into San Pedro. Here, everything was green and flat. I was pointed out the various villages as we flew over them. To me, a village is like a subdivision. It is about he same size, just with it being more of a community where everyone knows each other. I was told that her family lived a very simple life. They were comfotable with what they had and really that is all that matters. The area was largely populated by native Spanish speakers. I was informed early on that her parents spoke little English. We managed to communicate fairly well though using a unique Spanglish and hand gestures. I believe that if I had stayed in a Village such as this for 5 weeks I would have learned Spanish easily. Even with the slight language barrier, I was welcomed with open arms into their home. One of the first sights to great me, was a huge turkey walking around. Through the backyard, I could see many chickens and turkeys that the family raised, then sold. They also had different trees and crops that were grown and sold for more money. Every Sunday, the mennonites come for the chickens that the family prepares. I was actually able to witness them 'preparing' the chickens. Not something you would usually see occuring in someones backyard. At the time I visited, the people staying at the house were Loreni's Parents, Loreni and Luis, Loreni's two brother and her sister-in-law and her baby Justin. This did make for some close quarters, yet we made it work quite nice. The house was small by our standards, yet the were comfortable. There were 3 small bedrooms, a living room and a small kitchen. Not enough beds for everyone, hammocks were set up in areas of the house that were slept in. The 7 month old baby lives inland with the family and not on the island with Loreni. The reason is partially money related, and also that they woukd rather leave the baby with family. Justin usually naps in a hammock, but will sleep in the bed with the Grandmother. A mosquito net covers the baby when he sleeps to protect him. The family only had 4 channels on the tv and had no internet connection. Water was retrieved from the well in the backyard. There was an indoor shower, but there was no hot water. If you wanted a shower with with warm water, you had to fill a bucket with regular water, then add boiled water until it was the temperature you wanted. Then from the bucket, you use a bowl to pour the water over your head. It was an interesting experience. You get so use to just hoping in to take a shower, having to prepare then 'work' for your shower was a new experience. While I only spent a short time with the family, I really enjoyed my time getting to know them. I formed a bond that will stay with me forever. As I said goodbye to my new friends with hugs and well wishes, I'll always remember the last thing that was said to me. "Always remember your Belizean family." During our second full week in Belize, we had the opportunity of participating in community service projects around the area. A group of us volunteered at the local library running a 3 day Easter program for kids. The program was scheduled to be that Monday through Wednesday from 10-12 and 2-4. The children ranged from ages 4-9 with children from the various primary schools in the area. 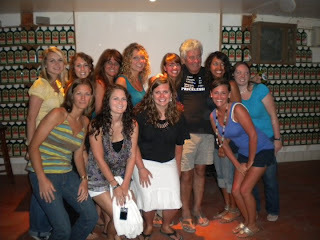 I was excited that one of the girls was a student in the class I was teaching at Isla Bonita. The amount of children changed each day and shift with there sometimes being only 8 kids to the most at 15 on the last day. Originally, the 10-12 session was to be story and craft time with the afternoon session was movie time. Prior to the first day, we met with the librarian to determine what was expected of us, to chose the books we would like to us and to see what supplies were needed. I was surprised in how many craft supplies the library had as well as the decent selection of books available. I found it interesting that the library seemed to have more in the way of supplies the many of the local schools. She said as long as we told her what we needed, she would get it. And she did a wonderful job of supporting us in this. In Belize, you often find yourself rarely fully prepared for anything. Even though I was unsure of exactly how the Easter program would play out I wanted to have plenty of ideas ready in case I needed to think of something fast, and I am glad I did! I came up with Easter related arts and crafts as possible ranging from Religious related to bunnies and eggs. The first day about 11 of us went, where we discovered that there was more of us then the kids! Unsure of exactly how to proceed we started with some sing-alongs with the kids. I taught the kids as well as the rest of our group how to sing Jesus Loves Me in sign language which became a hit not only with these kids, but to most of the island haha. I was pleased at how many people enjoyed the song and taught it to so many others. After singing many songs that many of us would regret ever teaching (Little Bunny Foo Foo...I don't ever want to sing you...again lol) we began with some crafts. Many of the old Sunday School activities came in handy during this time including how to make crosses out of palm leaves. What could be more appropriate to create the day after Palm Sunday in honor of Easter. That in addition to a bunny on a pop stick and some read alongs and we survived our first session! Realizing we had entirely to many people for the program, we decided that only a few of us would come back for the later session. As we prepared the movie, it seemed kind of silly for 4 of us to stick around even then. Not wanting to leave since we did make a commitment, I stayed while the other girls left. They couldn't have been gone for more then 10 minutes, when the natives got restless. I wasn'y long to determine that movie time wasn't going to work, but now I was alone with 9 kids of all different ages. I pulled out some of those craft ideas I was so glad I prepared, and we filled the afternoon with drawing bunnies, eggs and more. This was one of my favorite afternoons with the kids getting to share the one on one time. The following 2 days consisted of many more sing alongs (No more Little Bunny Foo Foo!) plenty of reading and a substansial amount of Easter crafts. We made bunny masks, hollow eggs bunnies, cards, an Easter wreath, Easter baskets and more! We finished our 3 day event with an afternoon of games and an Easter Hunt! It was so much fun and I was sad to see the 3 days end. I felt a sense of accomplishment after the service project. The parents and the children all had glowing comments about their time with us and in the weeks following on more then one occasion I would run into one of the kids and they would hug me with excitement at seeing me. Knowing the positive impact I had on these kids after only 3 days has shown me that alot of good can be done in a small amount of time if only someone tries. It was very exciting to have our project published in the paper not once but twice! To have a place in the paper about our project made our sessions reach out to the whole community. my supervisors for keeping the program running smoothly. Being shy, I tend to fall into the background and let others take charge yet by stepping up I was able to show myself just how capable I am. more profound impacts on me that I know I will never forget.